Women's a.n.a. 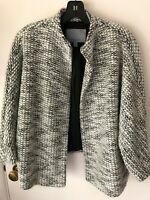 SIze M Medium 8 10 Gray Striped Cotton Jacket Blazer Ships Free! !